Have you seen the movie yet? I am dying to see it, especially after listening to the Les Miserables (Radio Theatre) by Focus on the Family!! Confession time, I saw the show at least 2 times while living in New York, at least once on Broadway and once at West Point. I knew I loved it, but could not have told you one single thing about it. I had no memory other than I enjoyed it. Not sure I even really understood it at the time, since I currently had no memory it. This time though, I loved it. I loved it!!! My kids listened as intently as I did and they thoroughly enjoyed it too! I cried at the end and I keep thinking about the characters – what they stood for, how they loved hard, and how through hard choices and tough times they overcame. As always, we love when Focus on the Family does these audio dramas, they do such an amazing job matching personalities with voices and the sound effects make you feel like you really are listening to a movie instead of someone just reading to you! 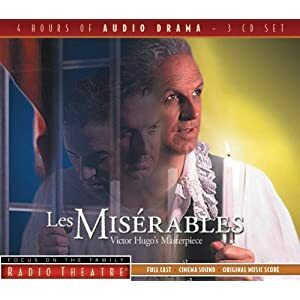 Les Miserables (Radio Theatre) takes place during the French Revolution and the story it tells is inspiring and humbling! Jean Valjean is a man whose integrity is above reproach, a man of his word; a man when given a second chance at life takes that chance and makes the most of it by giving. When the story begins Jean Valjean is being released from a 19 year prison sentence, he earned by stealing bread for his sister’s starving family. He meets up with a man who challenges him to take this freedom (new life) and make the most of it, start over, do something great. Jean does just that, he spends his life giving back, all the while raising young Cosette. Of course many things happen along the way, but this story will grab your heart. After listening to this audio drama I cannot wait to watch the movie and then I plan to get my hands on the book and read it too. I know that the end will not be a surprise, but I want to experience all that Victor Hugo meant for the reader to see, feel and sense when he initially wrote this book. The CD is recommended for children above the age of 8, but I do admit, our 6 year old listened along with us. I highly recommend this Audio Drama by Focus, or any of their others to include Oliver Twist, Christmas Carole, Corrie Ten Boom, and many others to include Adventures in Odyssey. We have loved everything we have listened to by Focus on the Family and trust you will to!! I did receive a free copy of Les Miserables in exchange from an honest review, by Tyndale House publishers.